New York — Dodge Data & Analytics, a leading provider of data, analytics, news and intelligence for the construction industry, will debut the new Dodge Construction Central platform at the American Institute of Architects (AIA) Conference in New York. As part of its strategic vision to create a single, unified platform for the construction industry, Dodge introduced Dodge Construction Central in January 2018. At AIA18, Dodge will offer demonstrations of the platform and its suite of capabilities. 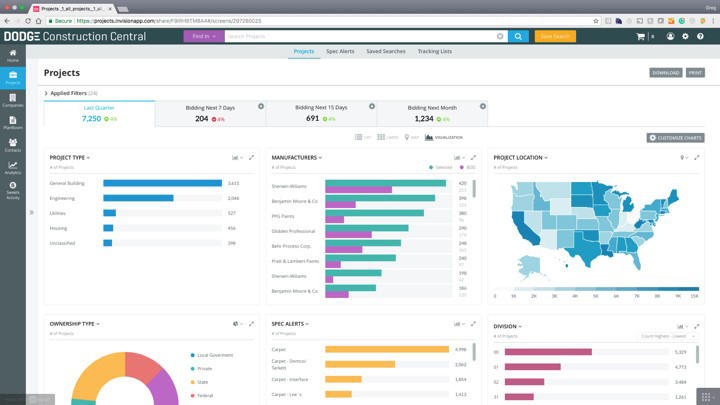 Integrating research, analytics, and collaboration capabilities into a single platform, Dodge Construction Central also seamlessly connects to CRM and marketing automation systems through enhanced API services to enable access to Dodge data in the systems on which construction businesses run. In addition to these new capabilities, Dodge customers will continue to benefit from recent innovations such as Basis of Design that were added to Dodge Global Network last year. For architect and design attendees, Dodge will also be demonstrating the capabilities of Sweets extensive building product database of over 100,000 products from over 450 of the most respected manufacturers. Visitors to AIA booth #1357 can learn more about Sweets, the Sweets app for Revit, Sweets app for AutoCAD, the 2018 Sweets College Scholarship for the next generation of architects, designers and engineers, as well as enter the 2018 Sweetstakes for a chance to win an Eames Chair and Ottoman. Learn more at https://sweets.construction.com/. Also at AIA, highlighting Dodge’s analytics and research expertise, Dodge’s Senior Director of Industry Insights Research Steve Jones will share his forward-thinking insights as a panelist on Harnessing the Technology Innovation Revolution, on June 21, at 7:30 a.m., in Room TH204. Jones will also present during the session titled Managing Uncertainty: New Project Planning Guide for Owners & Architects, on June 23, at 8:00 a.m. in Room SA108. The session draws on insights found in the Project Planning Guide, derived from a study developed in conjunction with the AIA Large Firm Roundtable and other sponsors, available for download at https://www.construction.com/toolkit/reports/project-planning-guide-owners-project-teams.